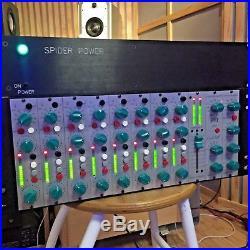 Spider 8-channel Class A Mic Preamp, Mixer, and A/D Convertor. Crane Song Spider - Dave Hill, whose resume includes designing some of the most respected preamps in the industry for other manufacturers, struck off on his own to found Crane Song, whose designs are not only born of his previous experience, but tested ("tweezed" as he puts it) in combat so to speak, in a professional, 24-track 2 studio while high-dollar clients look on. Crane Song's TEC award nominated Spider is a high-quality eight 8-channel mic-pre amplifier/mixer for recording engineers who do live stereo or multi-channel recording and want a very flexible audio path. The Spider's 8-channel output allows the system to function as an analog front end for DAW's, digital mixers, and modular digital recorders. Crane Song's Spider also includes a DSP process to provide tape emulation. Crane Song Spider at a Glance. High-quality 8-channel mic-pre amplifier/mixer wtih digital outputs. Stereo Bus can be assigned to digital out. Spider is a high-quality eight 8-channel mic-pre amplifier/mixer with two types of digital outputs: stereo and eight (8) channel. Spider's input preamplifier follows an extremely high quality Class A Discrete audio path, crucial to any critical listening enviroment. The stereo output is for recording engineers who do live stereo or multi-channel recording and want a very flexible audio path. The 8 channel output allows the system to function as an analog front end for DAW's, digital mixers, and modular digital recorders. The stereo bus of the Crane Song Spider can be assigned to digital channels 7 and 8. This allows a stereo mix of 6 channels to be assigned to digital outs 7 and 8 and leaves 2 channels independent. Drums; kick, snare, and stereo left to right. Both the discrete Class A pre-amp and the convertor modules are of a very high quality, low noise design. The maximum analog level at the insert points is +25dBm. The digital modules include a DSP process to provide tape emulation. Six to 66dB input preamp gain in 6dB steps. Pan control for the stereo output bus. Fat amp switch for a fat sounding audio path. 16 segment meter peaking reading 0=clipping referenced to the A/D convertor. Clip light on the pre-amp section. Peak limiter for the A/D convertor. LED indicator showing limit action. 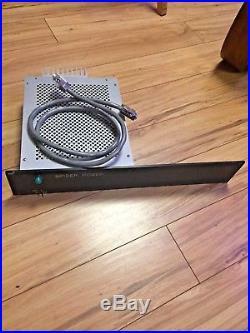 Channel insert point may be used as a pre-amp output. 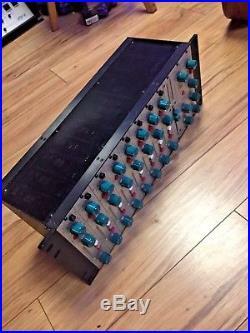 Stereo bus can be assignable to outputs 7 and 8. Switch selectable Analog Dither control, 15 to 24 bits. DSP analog tape emulation, adjustable by channel. The level is indicated by the LED's around the process knob. The level is changed by selecting the channel and turning the process knob. Digital output as AES, and ADAT Optical, or TDIF. The Crane Song Spider's extremely high quality, low noise A/D convertors enable unmatched clarity of audio conversion in it's class. The item "Crane Song Spider" is in sale since Monday, September 25, 2017. 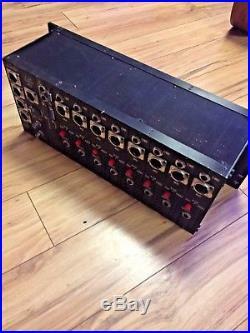 This item is in the category "Musical Instruments & Gear\Pro Audio Equipment\Preamps & Channel Strips".
" and is located in Davis, California. This item can be shipped to United States.